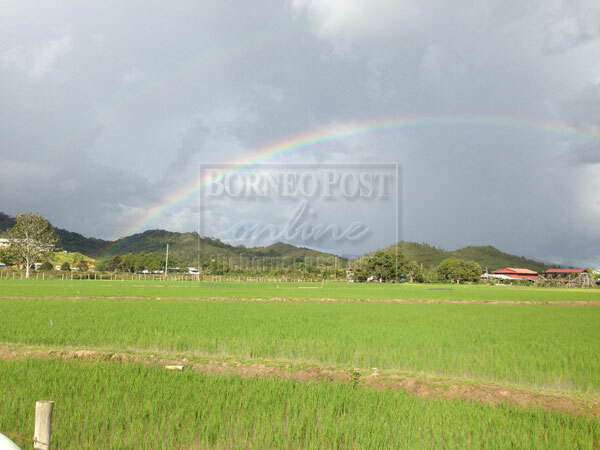 THERE IS HOPE: A rainbow over a rice field in Bario. KUCHING: The Bario Paddy Development Project has helped open up more areas with Bario rice in the Kelabit Highlands. At present, more than half of the project area is well irrigated and padi has been growing for nearly two months, said Thomas Hii, managing director of Bario Ceria Sdn Bhd – the joint venture company undertaking the project. He added that the project was almost 90 per cent completed, and the total area of padi field already planted is 145 hectares, which is larger than the area ever planted over the last 10 years. The only shortcoming, he lamented, was insufficient quality seeds for good quality crop to make this project benefit the farmers more. “Before this, Bario padi planting was in the downward slide, with more and more padi fields being deserted year after year. Before this project started, less than 60 hectares remained cultivated. With this project, it is obvious that we are seeing ‘life’ being re-ignited in the Bario (Kelabit) Highlands,” he said yesterday. Hii was responding to The Borneo Post’s Oct 4 report where it was alleged that the harvest of Bario rice, rated as best in the region and is rich in minerals and vitamins, is expected to be poor this year due to delay in completing the irrigation system. Bario Ceria is a joint venture between Ceria Alliance Group and Rurum Kelabit Sarawak to undertake the ‘National Key Economic Area (NKEA) Bario Paddy Development Project’ at a cost of RM17 million. The project, Hii said, was initiated by and fully supported by the Bario community, especially the farmers. The community appreciates the government’s commitment to help them restore abandoned rice farms and to help increase the farmer’s yield and income. The project includes the construction of seven irrigation dams with irrigation pipes to the fields, construction of farm roads, levelling of rice fields, ploughing, planting and harvesting services for 200 hectares of padi land in Bario, and the construction of a drying and milling factory. “The drying and milling factory located not far from the project site is complete with modern drying and milling equipment of a capacity of 20 tonnes per day of drying facility. Hii admitted there were problems with the delivery of water to irrigate some of the rice fields, but Bario Ceria should not be faulted for this problem. He said the existing irrigation system that should continue to irrigate the padi fields had not been well maintained, and it was unable to irrigate all the fields as mentioned in the Oct 4 news report. It was further compounded by the farmers’ assumption that the new irrigation system being built by Bario Ceria would be completed in time for this year’s planting season, which started in August. “The new irrigation system built by Bario Ceria Sdn Bhd is ready for more than 70 per cent of the total project area, and the contractual completion date is December 2013. “The maintenance of the existing/old irrigation system is not within Bario Ceria Sdn Bhd’s contract scope, but we did help to repair two of the existing/old dams. All the seven irrigation dams and the installation of the irrigation pipes are progressing on target to deliver water to the whole project area by December 2013. Hii said Bario Ceria would continue to do its best to assist the farmers, including providing water pumps to pump water into those rice fields that are not adequately operated. Hii added that Bario Ceria had been working non-stop to address issues highlighted by the farmers in relation to the project, and would continue to work closely with the local community leaders and block leaders, who are appointed by the farmers from among their group.